Our priority is to offer you, our customer the highest level of expertise and to cater for all your needs. Only the very best therapists are employed to offer our clientele an experience that they will want to repeat again and again. 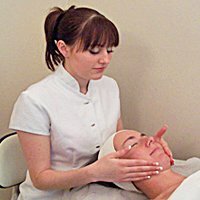 We stock both Ren'e Guinot an MD Formulations facial products which offer the client an opportunity to prolong the benefits of our facial treatments. Includes either a gel manicure or relaxing hand massage, file and cuticle treatment, half hour indulgence facial, back neck and shoulder massage 20 min, deep conditioning hair treatment and blow dry or dry and straighten. Tues - Saturday with late nights on Wednesday and Thursday until 8.30 pm. To speak to one of our team simply call on 01206 851770 or leave a message on our answering service and we will call you back to answer any questions that you may have.